We’d love your help. 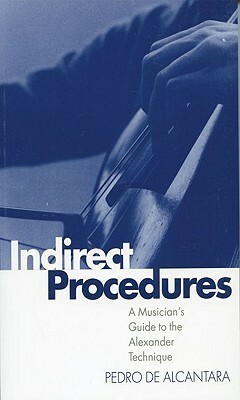 Let us know what’s wrong with this preview of Indirect Procedures by Pedro De Alcantara. To ask other readers questions about Indirect Procedures, please sign up. More philosophical than I initially expected- lots to unpack here and definitely will need a second read-through. Excellent. Everyone should read this book. Practical and useful information for anyone seeking to improve not just their habits but they're overall well being. It even addresses stage fright, and general stress. It explains Alexander Technique in logical terms. Very easy to read, but also very thorough. I won't hesitate to say: a life changer. Also, I took lots of notes. THE best book I ever read in school. This revolutionized the way I approach my instrument, practicing and performing. If not for the Alexander Technique, I would not have been able to continue playing the violin and this book made it accessible when I wasn't able to afford an Alexander Technique therapist. Even if you aren't a musician, you should read this book. Ever wake up with a cramp in your neck or feel like your back is all knotted up? Yeah, read it. If you are looking for info on the Alexander Technique, this is an excellent resource. Finally feel I understand its premises. While this is written at probably the college level, the author does a good job of providing examples of the sometimes rather nebulous concepts. Boiled down, a headache isn't just a headache. Mind-body-soul are all connected. Rather than steps to take, this talks more of undoing bad habits. Much to ponder. For musicians of all types. Fantastic book on Alexander Technique written just for musicians. This was the third time I tried to read it. The first two times I was not studying AT at the time. This really needs to be read and studied under the guidance of an AT teacher. And should be read multiple times. Not the easiest read, but a lot of valuable information. I enjoyed the lucidity, and highly logical and organised structure of this book, immensely. It resonated with much of the positive teaching I have experienced both instrumentally and through Alexander Technique, and helped contextualise and increase my understanding thereof. This is one of my bibles.